The web portal, the desktop client, and mobile devices can be configured to support non-English languages and varying timezones. These settings can be set for an entire organization for individual user accounts, or for guest accounts; users can also configure their own language and timezone preferences. With this feature, administrators can improve their support of users all over the world, and also provide users with granular control over their account settings and preferences. Note: Additional languages will be supported in future releases. Within the appropriate organization, click the Settings tab. The Settings page displays, showing the General section. In the Default Language drop-down menu, select the preferred site language for the organization, which also affects numbering formats. Leave this field blank to use the default language set for the system. In the Default Timezone drop-down menu, select the preferred timezone, which affects dates and times displayed across the system. You can also leave this field blank to use the system default. For more information, please reference the How Do I Create and Configure Policies Knowledgebase article. Click the Accounts tab. The Accounts page displays, showing all users within the selected organization. Alternatively, if you are managing guest users, hover over the Accounts tab and click Guests. Click the Edit button next to the user for whom you want to change settings. The Account Settings page displays for the user. In the Language drop-down menu, select the user’s preferred site language, which also affects numbering formats. 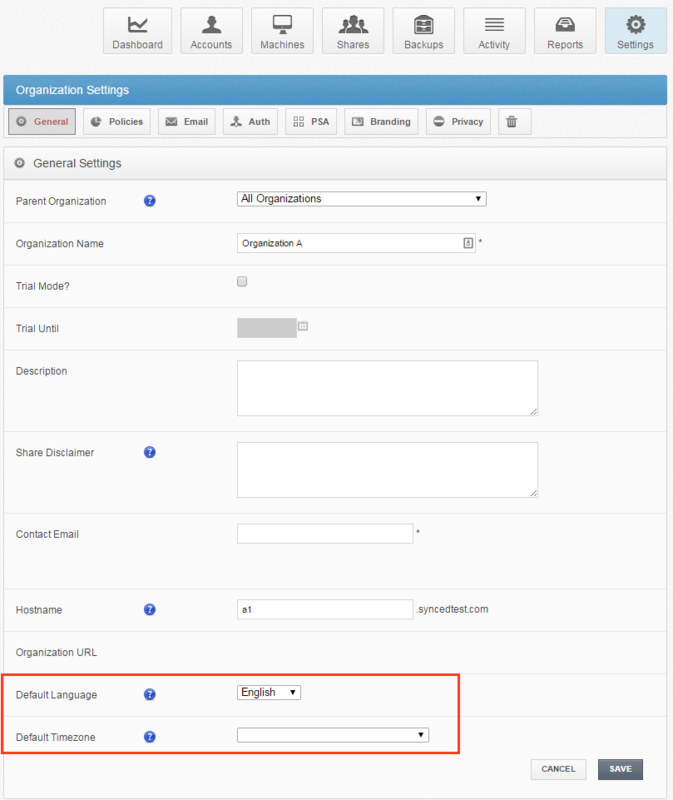 Leave this field blank to use the default language set for the organization, which you will see displayed when you hover over the blue Question icon. In the Default Timezone drop-down menu, select the user's preferred timezone, which affects dates and times displayed across the system. You can also leave this field blank to use the system default, which you will see displayed when you hover over the blue Question icon. 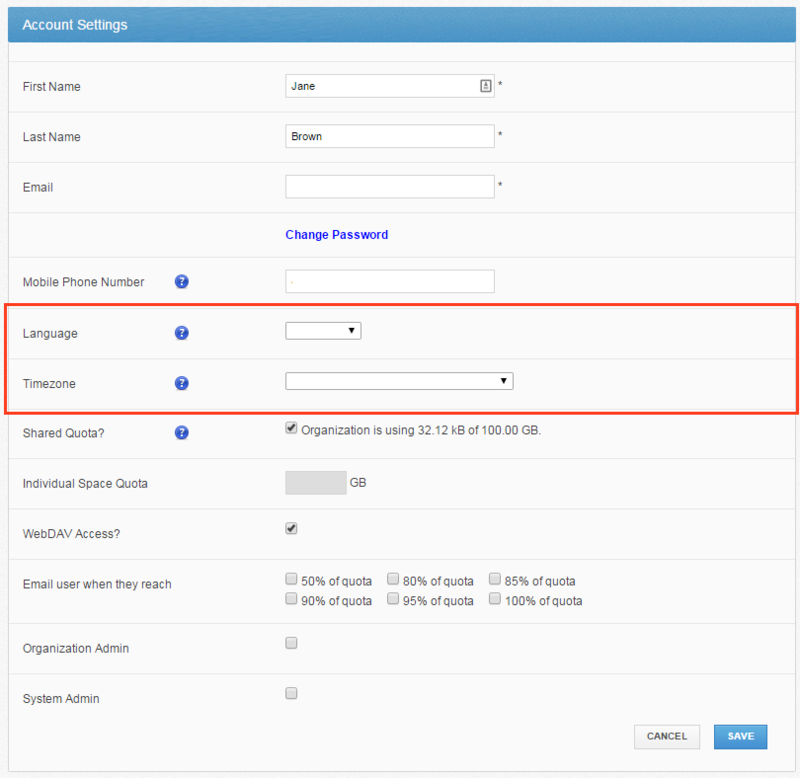 For more information on how users can configure their own account settings, please reference the How Do End Users Access and Manage Account Settings Knowledgebase article. For information on how end users can change their localization settings from their desktop client, please reference the Installing and Configuring the Desktop Client Knowledgebase article.